Stenhousemuir secured a memorable win and their place in the fourth round of the Scottish Cup by beating rivals Falkirk 4-2 in a pulsating local derby. 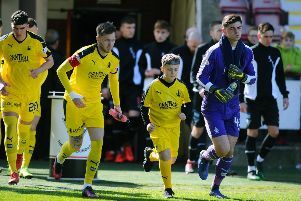 Paul Paton had given the Bairns the lead before the Warriors fought back with a double from Conor McBrearty, his first two goals in just his fifth senior appearance. Midfielder Joe McKee restored parity for Falkirk fizzing a low shot into the corner before the break. Warriors though took advantage of some dismal Bairns' defending and Sean Dickson added a third when he finished off a decent move, before Mark McGuigan clinched victory with a composed finish after bursting through the middle. It's the first time since January 1936 that Stenny have beaten Falkirk at home and they thoroughly deserved their victory. For the Bairns it is a disastrous result and they will need to make sure it doesn't undo the progress made in recent weeks. Both teams were not heading into this with much confidence with Stenny bottom of League One with interim boss Colin McMenamin in charge, while Falkirk were bottom of the Scottish Championship and look like staying there on the evidence of this 90 minutes. The Bairns were dealt a blow with Scott Harrison pulling up in the warm up and he was replaced by Muirhead who returned ahead of schedule from an ankle injury. They started the brighter of the two teams and opened the scoring after seven minutes. It was good play by Demi Petravicius who burst in behind the Warriors' defence and cut the ball back for Dennon Lewis, he had a couple of efforts on goal, which were blocked, but Paton fired home the rebound from close range. If Falkirk fans, who had brought a great support, thought they were going to be in for a comfortable afternoon, they were sorely mistaken as the Warriors came roaring back into this Cup tie and turned the game on its head with a quickfire double from McBrearty. Leo Fasan had denied Sean Dickson and Conner Duthie on separate occasions with impressive saves but he could do nothing about McBrearty's double. The on loan St Mirren defender took advantage of slack defending to send a powerful downward header beyond Fasan, and bundled another header home moments later to put the Warriors into the lead. And that advantage could have been extended when Warriors threatened again on 35 minutes as Paton released Cook down the wing and his first time cross was headed agonisingly wide by McGuigan. At the other end, Lewis curled an effort just over as Falkirk searched for an equaliser. They wouldn't have to wait much longer and McGhee ventured forward and played it into the final third, it was flicked inside to McKee who drilled the ball into the corner. The Championship side would have expected to push on and grab a third but the Warriors had other ideas. They seized the lead on 59 minutes though once again there were questions marks over the Bairns' defence and the simplicity of the goal. Harry Paton dinked the ball over the top, found Ferry in acres of space and he drove forward and squared to Dickson for a tap-in. The Bairns picked up a flurry of bookings with McKee, Kidd and Muirhead all being shown yellow as their desperation increased. If anything Stenny looked more likely to score and Dickson came close when attempted to bend the ball into the top corner but Fasan saved. McGuigan finally wrapped up a memorable win when he slotted home for his sixth goal of the season to knock their illustrious opponents out of the Cup.